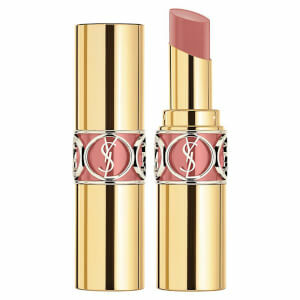 Accentuate your pout with Yves Saint Laurent Val Vinyl Cream; an ultra-hydrating liquid lipstick with full coverage and mirror-like shine that lasts for up to 10 hours. 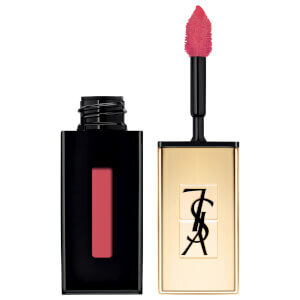 Combining the all-day wear of a stain with the high-shine of a lip gloss and the creamy texture of a lipstick, the weightless formula glides on effortlessly to deliver intense, comfortable colour. 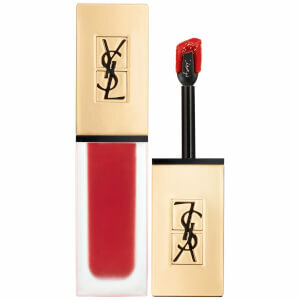 Features a diamond-shaped applicator to enhance natural lip shape for a professionally contoured finish. Available in a range of shades. Use the pointed applicator tip to create a dramatic cupid’s bow. Start by pressing the tip onto each side of the bow to emphasise the shape. Then sweep the flat side of the applicator from each corner - top and bottom - up to the middle again. Aqua / Water, Octyldodecanol, Trimethylsiloxyphenyl Dimethicone, Ethylcellulose, Synthetic Wax, Cetyl Alcohol, Alcohol, Polybutene, Glyceryl Stearate, Behenyl Alcohol, Steareth-20, Phenoxyethanol, Sodium Lauryl Sulfate, Glyceryl Stearate Citrate, Disodium Ethylene Dicocamide Peg-15 Disulfate, Hydroxypropyl Guar, Calcium Aluminum Borosilicate, Synthetic Fluorphlogopite, Stearyl Alcohol, Myristyl Alcohol, Magnesium Silicate, Calcium Sodium Borosilicate, Aluminum Hydroxide, Sodium Saccharin, Alumina, Benzyl Alcohol, Silica, Tin Oxide, Anise Alcohol, Parfum / Fragrance, [+/- May Contain: Ci 77891 / Titanium Dioxide, Ci 15850 / Red 7, Ci 77491, Ci 77492, Ci 77499 / Iron Oxides, Ci 15985 / Yellow 6, Ci 17200 / Red 33, Ci 15510 / Orange 4, Ci 45410 / Red 28, Mica, Ci 19140 / Yellow 5, Ci 42090 / Blue 1, Ci 75470 / Carmine ], (F.I.L. B182481/2). I looked for shade 407 EVERYWHERE not only locally but even when I traveled with no luck...then I found it here and bought not one but TWO which was a great decision on my end cause it’s out of stock online as well! It’s a liquid lipstick that turns into a creamy texture, the shade is GREAT and compliments my Olive-ish skin tone. I do have to reapply it every now and then depending on the day and what I drink/eat throughout the day, the good news is the packaging does not take much space to you can carry it around whenever and wherever and reapply easily. PS: little amount goes A LONG WAY. You don’t need much to have a great strong shade.